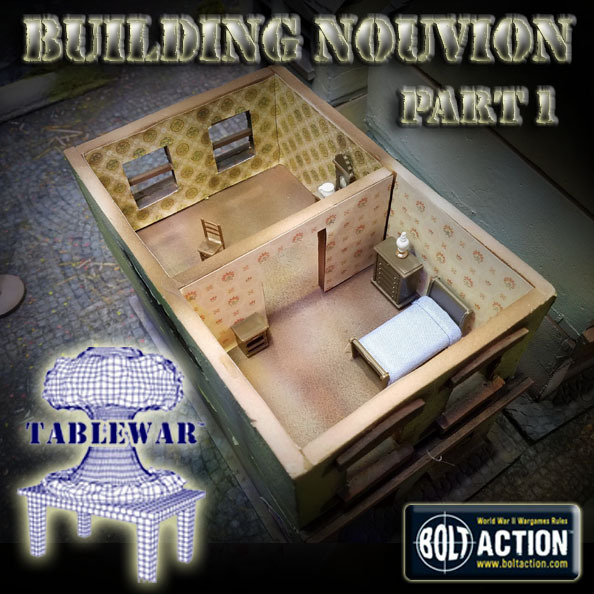 I have been continuing to work on the latest terrain board for my Bolt Action battle reports... attempting to create the town of Nouvion! 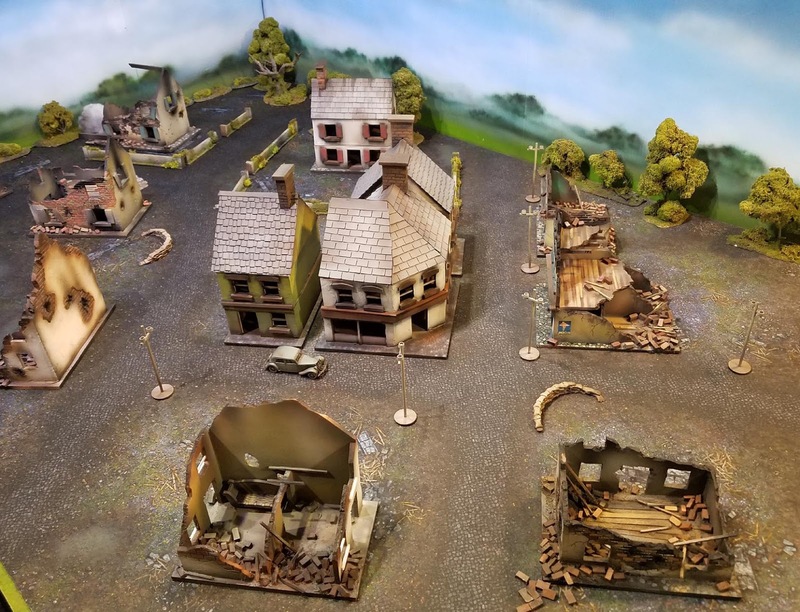 As I mentioned in the link, this table is built around the TableWar cobblestone town mat. 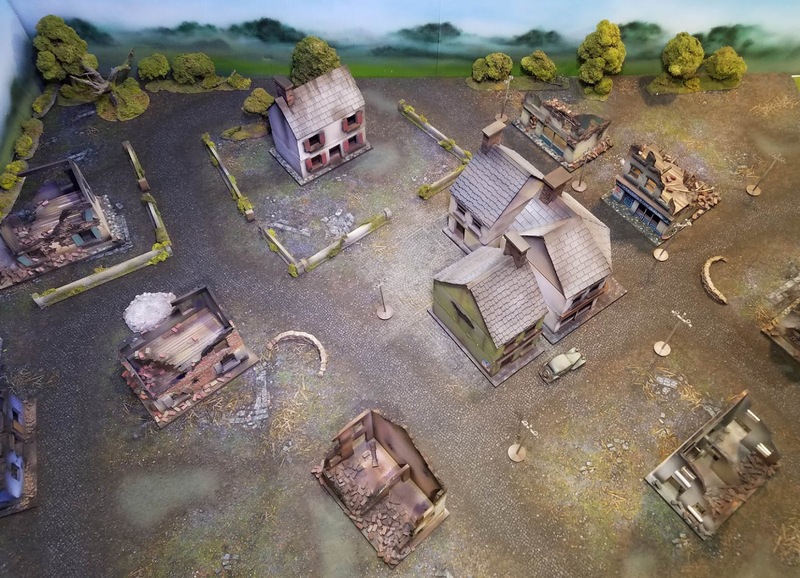 In the article, I talk about how I have been trying to build to the design of the mat itself, as opposed to simply plopping a bunch of scatter terrain around. 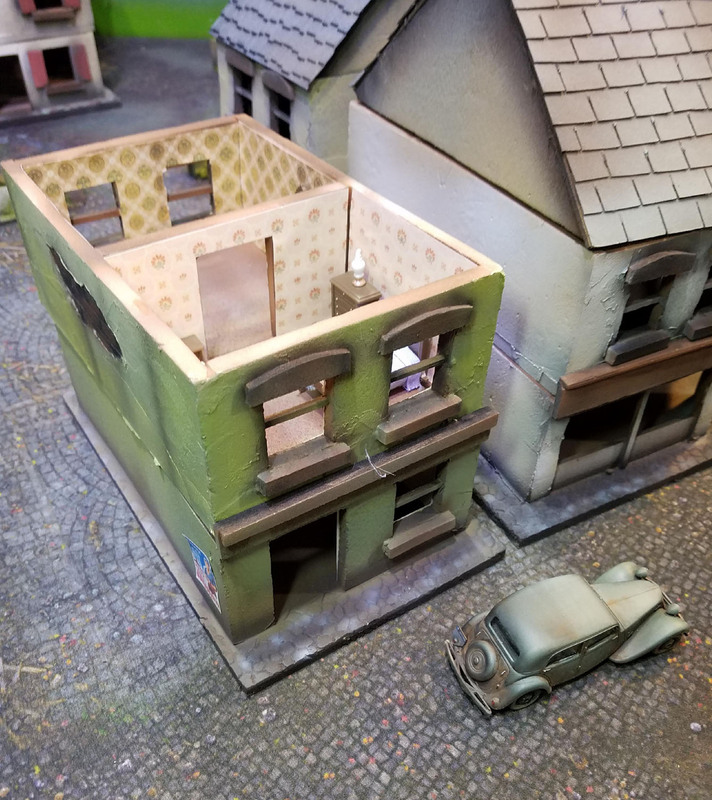 I am trying to create some interesting viewpoints, multiple levels of combat, line of sight blocking, hard cover, blind alleys and so on. This goes as far as attempting to match the cobblestone around the edges of the buildings! 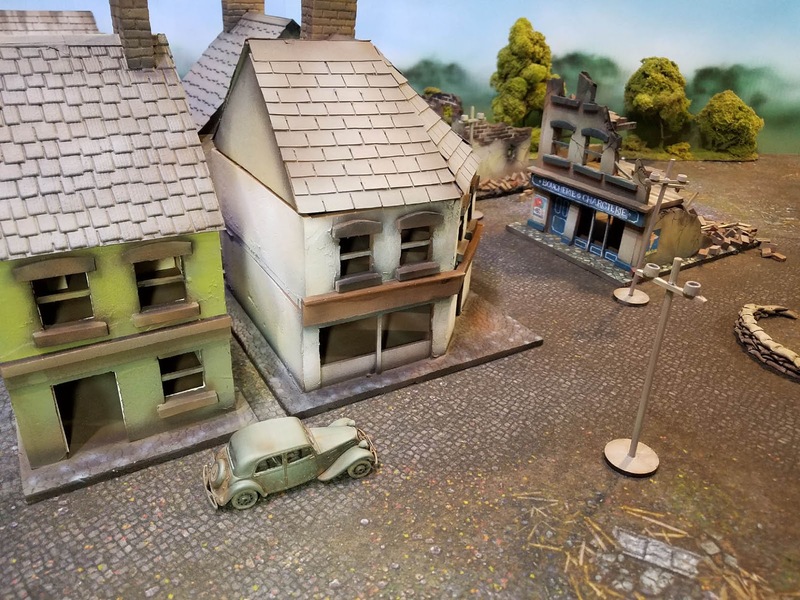 Over the last few years, I have been studying all kinds of terrain that has an urban feel to it. This can be a little more tricky than the natural forest style boards, as it needs even more scatter terrain. Also, having those ruins look a little more realistic has been an obsession. 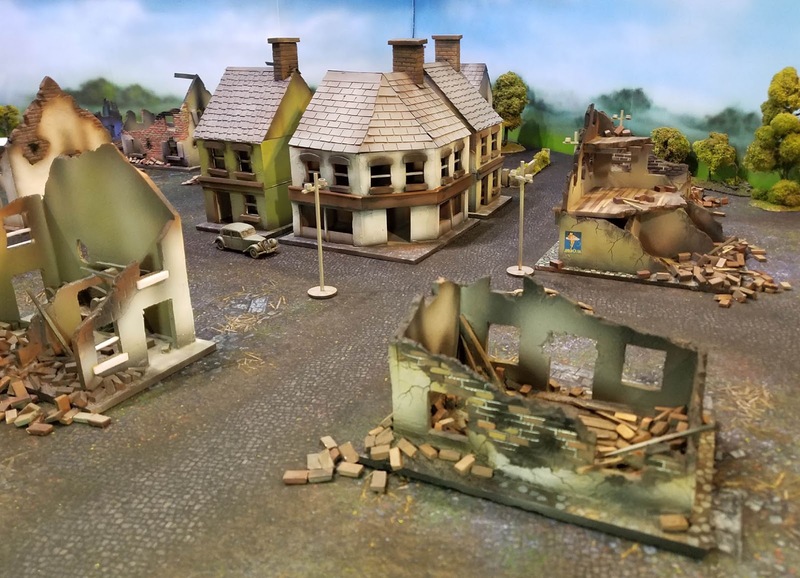 One aspect of working on my Monte Cassino display board involved a large amount of rubble. 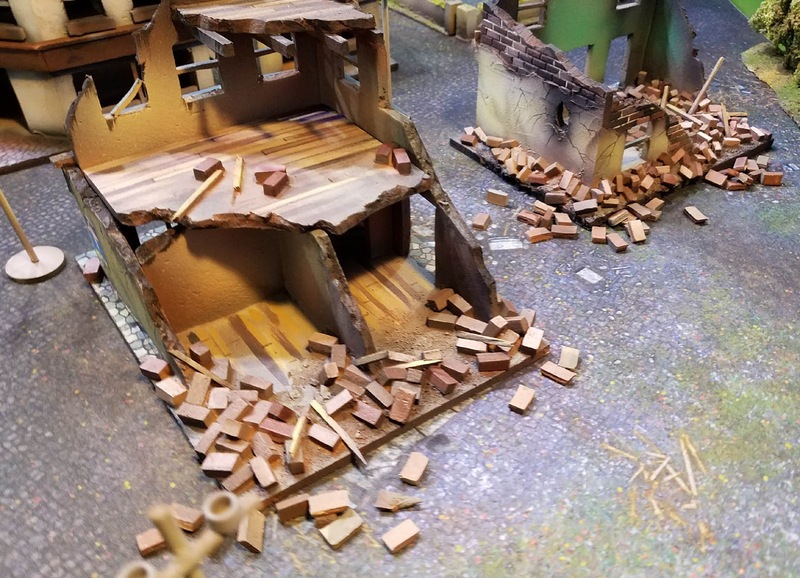 I wanted to be able to "extend" the broken brick rubble piles beyond the buildings and the initial "base" as you see in this image. 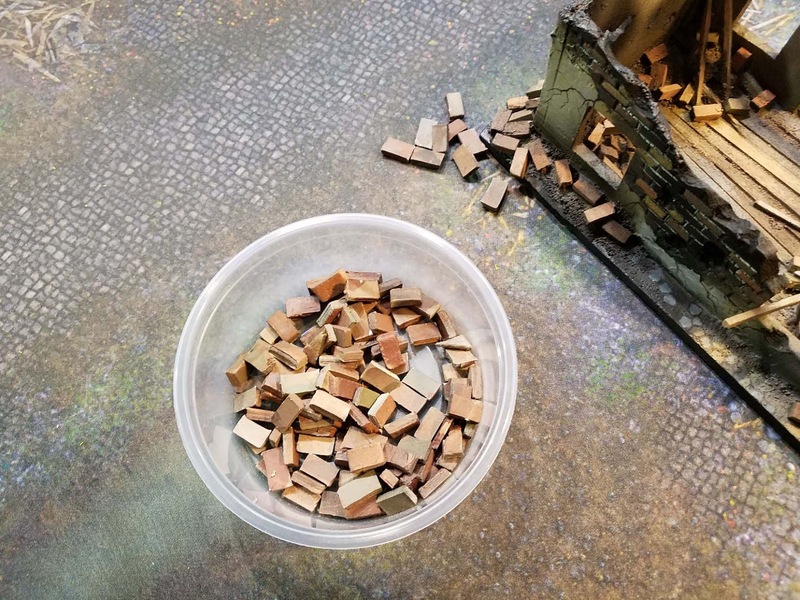 However, I knew that having a lot of loose bricks all over the place would mean extra work cleaning things up, not to mention the labor in making them all! 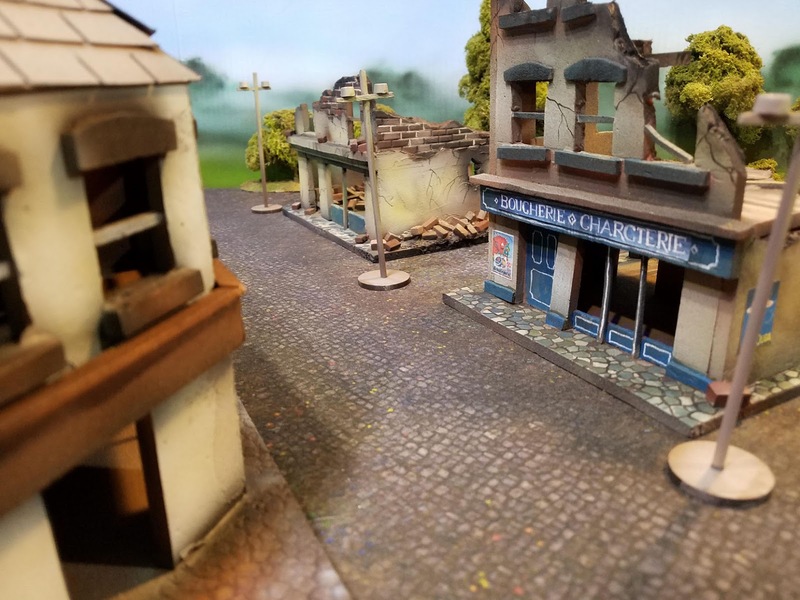 Fortunately I learned about Das Modeling clay, which is a very sturdy, inexpensive air drying clay which turned out to be very handy for making a LOT of bricks in a hurry. I will try to do more of a step by step article on that for you later. It was a little frustrating to learn about my misspelling on the Butcher's shop sign, but I was still happy about the building, the posters, etc! Here we see the scatter bricks, extending out beyond the buildings. 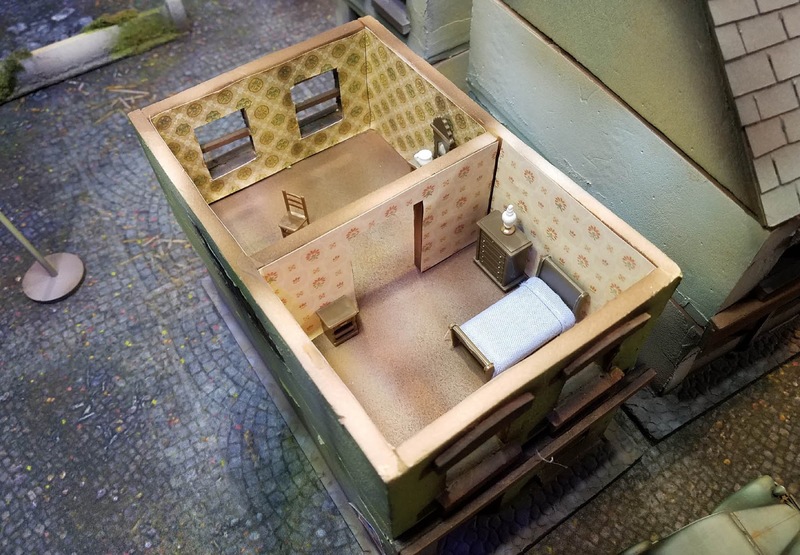 This provides a little more rational appearance to the broken walls, and something which will play off the city fight rules in Bolt Action. 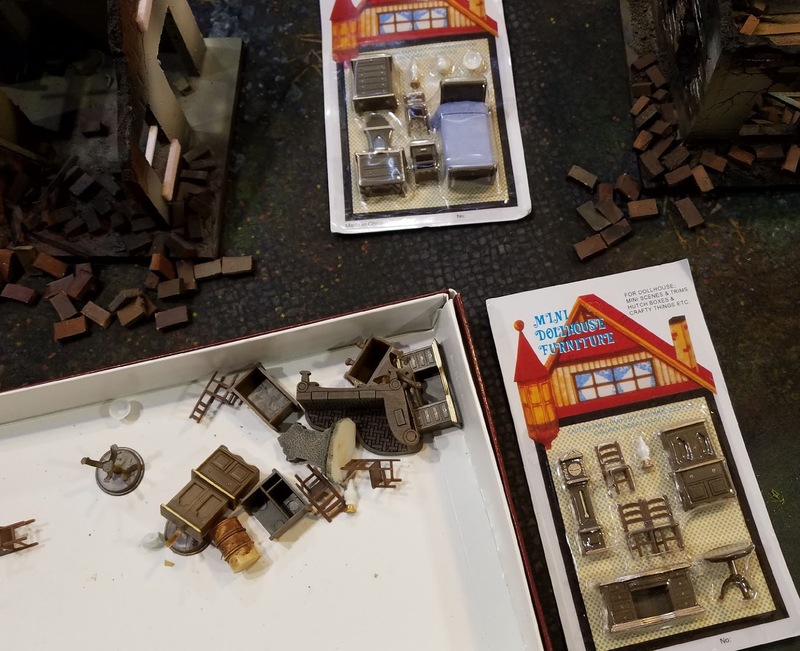 I know there is a table for rubble, and I definitely wanted to include them. 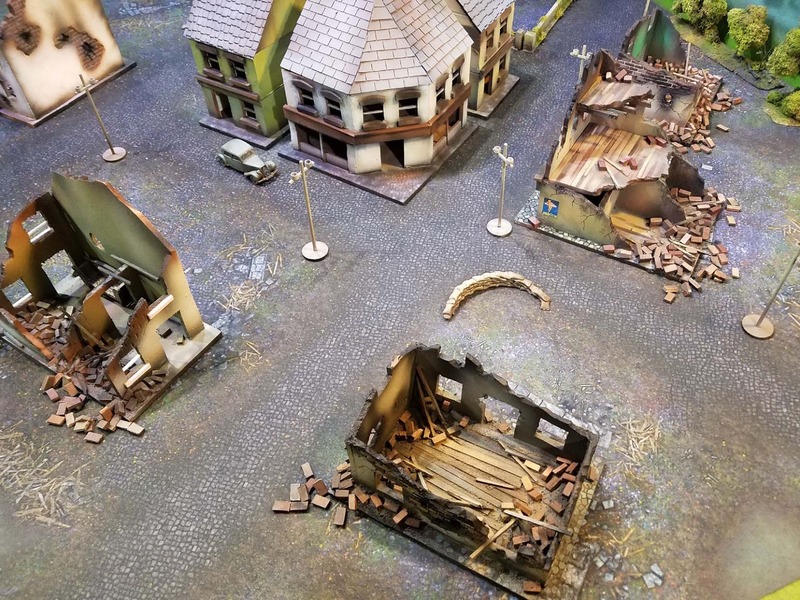 When I start to work on the more urban tables like Stalingrad, Budapest and Berlin, I will have immense piles of masonry around. 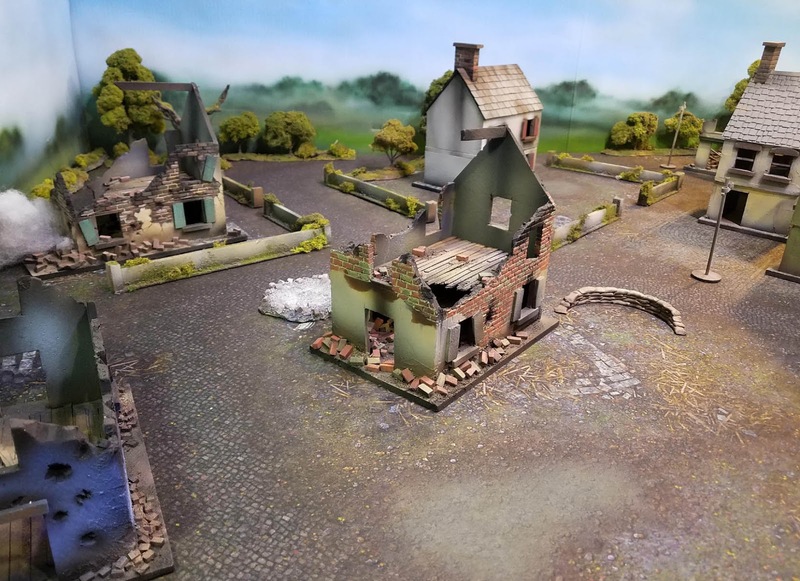 Not just individual scatter bricks, but actual pieces of terrain which look like troops have dug out some of the bricks to create a gun emplacement, etc. 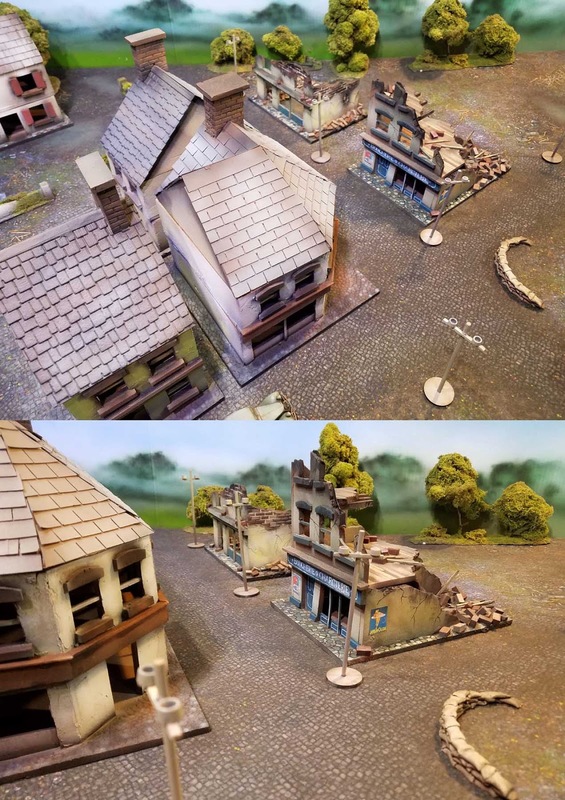 An overview of the buildings, which was very satisfying! Things are starting to come together! I have a lot of signage to do on the buildings in the central square, as well as other weathering effects, windows, and more posters! I think it might be fun to have a new more of these cars, and perhaps some trucks as well. Might have to scratch build those. 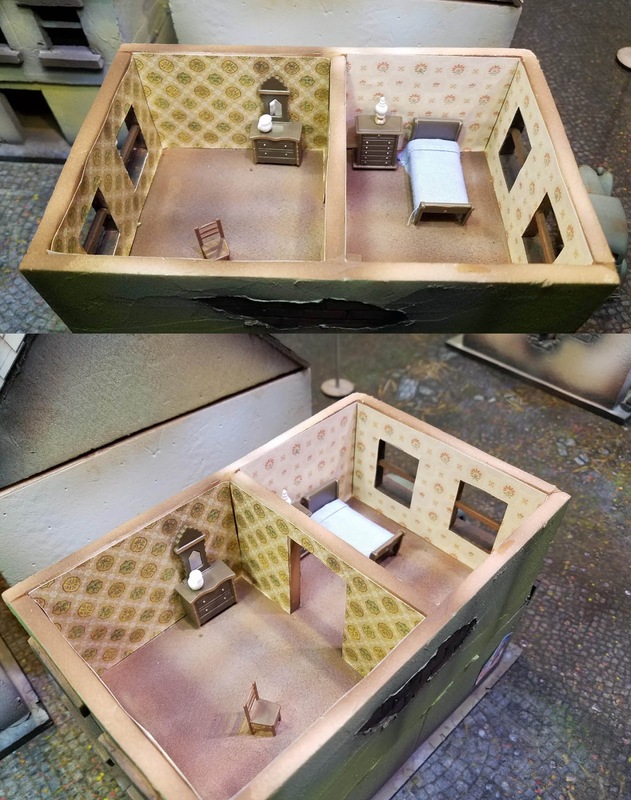 I have some of the interiors finished on my intact buildings, complete with wallpaper! This was a very cool result... and it made me really happy I had gone through the effort of creating the wallpaper. I will also try to create a step by step blog post around my process for making the interiors.